When Hachiya persimmons are ripe, they're divine. When they're not, there are few things that taste worse. I remember as a child going to the farmers' market with Papa when Hachiya persimmons were in season. We would buy them by the case. I couldn't wait for them to ripen, but like many things in life, patience was rewarded. We would speed up the process by placing a banana and an apple with the persimmons in a paper bag. Everyday, I would come home from school, stick my hand in the bag and check to see if the persimmons were ready. I knew they were ready to eat when they felt like they would fall apart in my hand. For those who have not had the pleasure of tasting this exotic fruit, the texture is similar to jelly, but the flavor is so unusual that it's almost indescribable. 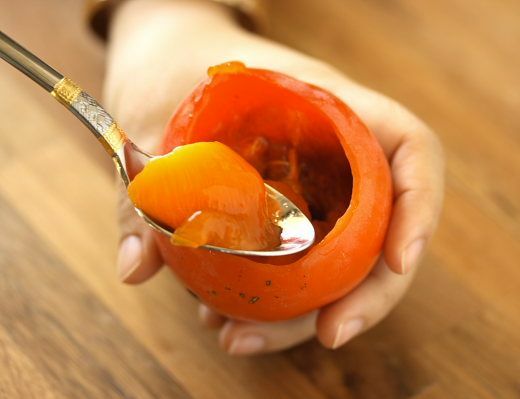 There are hints of apricot, quince and mango, but none of these fruits truly captures the unique taste of a persimmon. Eating them is quite simple; just core and remove the stem end and dig into the pulp with a spoon. You just have to make sure that the persimmon is absolutely ripe or you'll end up with cotton-mouth. Unripe persimmons have a very astringent quality to them, just like quince. If you're fortunate enough to find these exquisite fruits at your local market, pick up a few (or buy them by the case as we do), wait for them to reach the perfect ripeness and enjoy! ** For those interested in cooking with persimmons, the Fuyu variety is much better. They're firmer, which allows for many different cooking techniques. My personal favorite preparation is caramelized Fuyu persimmons; you can also make an almondine tart with the fruit. 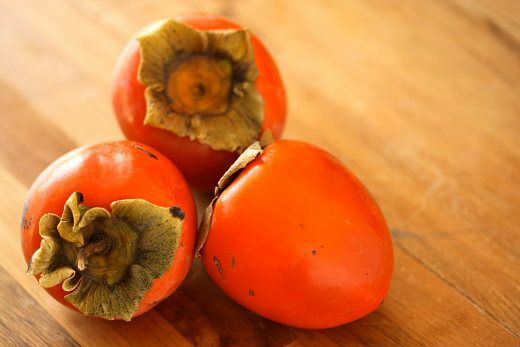 Carole's Note: You can use Hachiya persimmons in puddings or custards. I'm definitely going to get a recipe from Carole, try it out and post it for all of you! I agree there...I am really pretty new to persimmons and had my first taste of a not quite ripe one a couple weeks ago. Umm yeah, indescribably foul....but the ripe ones! WOW!